It’s sometimes hard to notice the subtle benefits of landscape lighting. Some examples are beams on nearby cacti or a spotlights shining up trees. There is one form of landscape lighting though that often catches our eye, path lighting. Path lighting is one of the most important forms of landscape lighting and, when utilized properly, it can prevent falls and injuries. 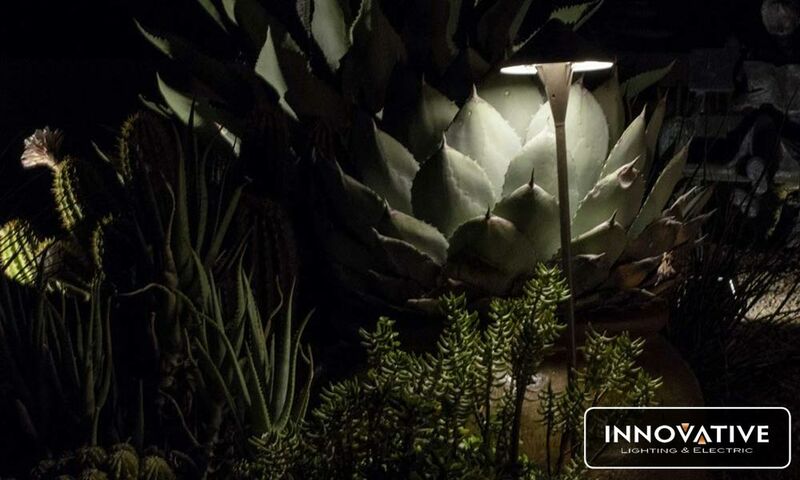 Here at Innovative Lighting and Electric we specialize in providing path lighting that fits your yard. Our design team will come out, survey your property and find the perfect fit. With both FX Luminaire and Vista Professional Lighting products we can make your paths shine bright and keep every safe for years to come. Vista Pro offers a wide variety of Path Lights. Their options range in color, size and texture. We’ve found that brass and copper lights add a sense of sophistication to any yard while also being cost effective. Their durable, metal materials tend to last longer in the desert sun. Our go to path lights are the 2160 series. With their thick base and small cover the 2160 offers a sturdy, attractive light. By far our most popular light is the FX Luminaire SP: Path Light. What makes the SP so popular is the fact that it fits in with almost any yard design. The SP is small in size but powerful in performance. The copper frame creates a sturdy structure that will stand up to the desert elements. The optional powder coating also helps improve the lifespan of the light while allowing you the choice of several different colors to better fit in with the scheme of your yard. So take advantage of path lighting today. With the proper design and the correct lights you can create a beautiful, safe walkway for everyone to enjoy. Contact us to get path lights installed today!